Who says you can’t have it all? When you travel to Tangier, Morocco, you can have all that you ever dreamed of in the perfect vacation like abundant sunshine, unspoiled beaches, intriguing historical sites, vibrant markets and friendly locals. Located on the northern coast of Africa near the Strait of Gibraltar, Tangier straddles the gateway between Africa and Europe, which makes the city a colorful array of cultures and languages. If you are in need of some rest and recreation, head to the beaches of Tangier where soft white sands and sparkling turquoise waters beckon the weary traveler. Lined with several nearby restaurants, Tangier Beach may very well be one of the few beaches where you will see camels trotting by and kids playing soccer. While relaxing at Tangier Beach, not only can you glimpse wonderful views across to Spain, but you can also watch huge ships passing in the distance as they approach the Straits of Gibraltar. 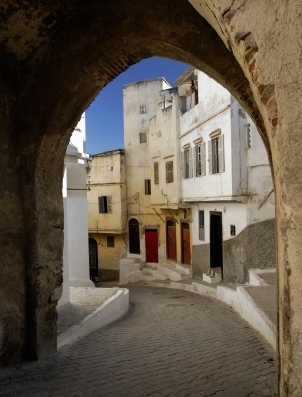 A must do while visiting Tangier is a stroll along the lively Medina, the “old city.” Here, you can meander along winding streets where you will see multicolored buildings and smell wonderful aromas from the various food vendors. Browse the shops for unique trinkets and souvenirs. Enjoy a cup of Moroccan tea in one of the many tea-houses. Also in the Medina, you will discover the Grand Socco, a busy square packed with markets and vendors. Additionally, the Medina offers interesting historical sites such as the American Legation, which is the first piece of property ever owned by the American government outside of the Unites States. As a museum, research library and cultural center, the American Legation is an interesting place to visit. If you love history, you can’t miss out on a visit to the Kabash. Situated at the highest point of the city, the Kabash offers you views of two continents at one time as well as breathtaking ocean views. Beyond the gates of the Kabash, you can tour the splendid 17th century Sultan’s palace, Dar El Makhzen. Inside the palace, you can admire the elaborate interior with its intricate carvings and beautiful marble features. The palace now houses two museums also worth visiting. The Museum of Moroccan Art showcases excellent examples of Moroccan art while the Museum of Antiquities displays a spectacular collection of ancient artifacts. Whether you are a shopping fanatic or not, you will find that exploring the markets, bazaars and souks in Tangier to be a worthwhile adventure. You will discover all sorts of bright and unique items such as beautiful Moroccan slippers and Arabian carpets. If you enjoy shopping for a bargain, make sure you check out the Casa Barata Flea Market. Meaning “cheap house” in Spanish, the Casa Barata is the place where you can find great deals on everything from fresh produce and spices to clothing, carpets and electronics. You can begin you travel plans to Tangier now by comparing hotel prices online at HotelDealSite.com. Tangier offers a great number of small, budget motels and hostels as well as mid-range and luxury hotels. Secure a reservation today, so that your room will be waiting for you when you arrive in Tangier, the destination where you can have it all.